Making good presentations takes a lot of time, and I felt fellow teachers and in the community could reuse this one. 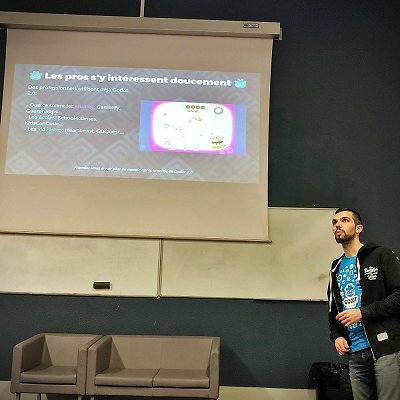 As Godot has an international community, we would need to translate the slides and to use a technology that would allow us to improve it over time. Traditional slideshow programs are not designed for that, so they were out of the question. It turns out there's a mature technology that would allow us to create many translations with ease, to showcase interactive game demos, and lot more than that: the Godot engine itself. That is how Godot Slides was born. Slides 2.0 is a complete makeover of the slideshow system: it is now entirely drag-and-drop, it's modular and extensible, it uses Godot's built-in translation system, the engine's UI system, and it's easier than ever to insert game demos inside of your slides! You can even change the language in real time if, like me, you have to give it into two languages at the same time. It's a short talk you can give at gamedev meetups, or for longer presentations, to get everyone on the same page before showcasing the editor for instance. The Power Pitch is still a little technical, with a few slides targeted at developers. But as it's short, it should not be too dull either. New languages and better pictures: we need your help! At the time of writing, the presentation is already available in English, French, Japanese (written by me, so it needs proofing), and Spanish thanks to Antonio Torres Moríñigo. Even if you're not familiar with Git, but you would still like to do translations, you can still contribute as explained in the tutorial, be part of the project history, and appear in the contributors' tab! Please help us translate it into new languages! It will help people in your community cover the engine in their native language. This contribution will count towards your Hacktoberfest progress as well. We're also looking for beautiful pictures of the editor with professional grade assets, to not only showcase some of the latest features in Godot 3.1 but to hopefully impress people. You can get Slides 2.0 project on GitHub right now (please give it a star to help more people find it). When you give the presentation somewhere, feel free to ping me on Twitter @Nathan_GDquest! I'd love to know if people are using it!